If Amir Khan loses his next fight badly he will retire. I honestly believe that. After his frustrating defeat to Lamont Peterson and his surprising knockout loss to Garcia, a third defeat in a row will have Khan questioning his involvement in the sport. I’m not just making this up. Last year Khan put the boxing community in a mild state of surprise by announcing his intention to retire aged 28, an extremely young age when you consider that 13 of the current top 20 light welterweights are 28 or older, and people like Paulie Malignaggi (31), Juan Manuel Marquez (39) and Zab Judah (35) are all fighting in world title matches after they have breached the 30 year old barrier. "By 28 I’ll have done everything I want in boxing and I can sit back, chill and get fat." Khan has stated a concern for Dementia Pugilistica as motivation behind his plans to retire early. Certainly this is something any professional boxer should be wary of, and a man like Khan who has already made enough money for one lifetime ought not to worry about fighting to put food on the table. Dementia Pugilistica, brought to widespread attention by suffers like Sugar Ray Robinson and Joe Frazier, afflicts boxers who take repeated big blows to the head. This puts warriors like Erik Morales and Marco Antonio Barrera in the high risk group, whereas defensive masters like Floyd Mayweather shouldn’t be too concerned. For the most part of his career, Khan hasn’t taken big punches. His worst fights have been against Prescott, Maidana, Peterson and Garcia. He doesn’t have many wars. Khan is 25, so that only gives him three years to accomplish everything he needs to in boxing by his clock. But despite what he said about retirement last year, Amir was quick to anger when Carl Froch dared to suggest he should have retired after the Danny Garcia loss. 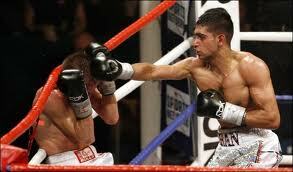 Khan hit back, denying he had any plans to quit and suggested that Froch keep his opinions to himself. "People believe 'Amir should be moving up, doing this, doing that'. People forget how old I am. I'm still young and there's a lot I need to work on before I do move up to the next division." The words coming out of his mouth say retirement isn't on the cards. Even so, if Khan were to lose his next fight by a vicious knockout a pattern would be starting to emerge, and it would be one that makes Khan’s Dementia Pugilistica concerns look legitimate . A third career knockout loss would set Khan’s top-level career back three years and exacerbate his fears over ending his career punch drunk, and I don't think he would risk a forth. Amir Khan is one bad loss away from retirement. If you enjoyed this even in the slightest then please share it using the buttons below. Even if you share it so you can show your friends how wrong we are, it's all good.